Not all corporate speakers are created equal. Before you hire a speaker, it's your job to figure who the perfect speaker is for your group. There is no one singular place to look for a corporate speaker. So, it can be a daunting task to find the right speaker to deliver the right message at the right price. "How long have you been in business?" and "How many talks have you given? ", seem like obvious questions. But, they don't ensure a particular corporate speaker is engaging, or a match for your group. "What will be your call to action at the end of your talk?" This may be the single most important question you can (and should) ask. Without a call to action at the end of a presentation, your audience has no action steps. That means, when the speaker is done, there is no transformation for your audience. Without transformation, the speaker doesn't move your audience. Typically, I work with my clients to design my talk to meet their needs and create a call to action that will give them maximum value, once my talk is over. "Do you provide any follow up materials in the weeks following your talk?" Zig Ziglar said, "Motivation is like bathing, that's why we recommend them both daily." That principal holds true whether a corporate speaker's talk is motivational or instructional. If you are in sales, you have likely heard the phrase, the fortune is in the follow up. Sadly, most speakers arrive, give their talk and then leave. A speaker who desires to make true transformation, will have some type of follow up built into their price. For example, I always include one or two videos made exclusively for corporate my clients. They may distribute those who attended and also to some who may not have been in attendance! The videos length is usually about 30 minutes of additional content or a deeper dive into the content and ideas presented in the talk. It also gives you with an opportunity to provide the audience with a reminder of the call to action! If the corporate speaker you are considering to hire is also an author, ask "do you include books for attendees as part of your booking fee?" If you are paying an a speaker to present to your group, the last thing you want is for them to sell to your audience from the stage. You are paying them for their time to speak, not to sell books. So, why not ask if they will include copies of their book as a part of their fee. If you are trying to decide between two speakers, this can be a great way to make a decision. Take the speaker who is offering more value for your audience! I offer up to 100 copies of my hard cover book, Break Down the Walls to Success for every paid booking. That's $2,500 of extra value! As a follow up, you should request that the speaker stay after the talk for a book signing and photo op. Bonus Ninja Hack! You should talk to every corporate speaker you are considering, before you book them. Never book a speaker based upon their website or a recommendation. Even if you have heard them speak, you should take time to make sure they are a fit for your group. The best way to do that is by speaking with them personally. However, don't talk on the phone. If you really wish to get a feel for the person you are about to hand over a chunk of change to, you should meet over a video conference. You will get a much better sense of their demeanor, personality and presenting skills when you can see each other. My favorite method is Zoom.us. It is easy to use and you don't need an account to use it. Skype is also a great way to go, but not everyone has an account. The next time you find yourself in search of a corporate speaker for your event, ask these three questions. You will have a far greater chance of hiring the right person and having a successful event. As a speaker, my goal is to make your event successful and have your audience thank you for hiring me! Bearj Jehanian is a highly sought-after Corporate Keynote Speaker and Workshop Leader who can speak for groups ranging from 20-20,000+! He will inspire, motivate and equip your Leaders and Team to have World Class Success! 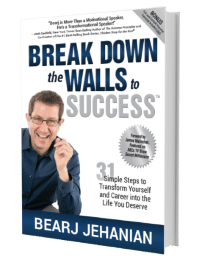 Bearj believes that Breaking Down the Walls to Success is the key in every area of business, leadership and life.